A few articles ago now I talked about the original Waimate Court House and it’s relatively recent new life as the Waimate Museum. The large section on which it is situated is also home to several other buildings which have been shifted onto the site. These include the old Douglas school, Bremners Cottage, the old jail and police cells. These buildings house a diversity of displays depicting life and times of old Waimate and very charming they are too. Unfortunately the facilities were all closed when I visited but I was quite taken with the tiny Bremners cottage. It is displayed amongst a simple cottage garden and fronted by the quintessential white picket fence. The cottage was built of pit-sawn Totara using a system of mortise and tenon joints. A mortise and tenon joint is a type of joint that connects two pieces of wood by slotting one piece into another. Woodworkers around the world have used it for thousands of years to join pieces of wood, mainly when the adjoining pieces connect at an angle of 90°. In its basic form, it is both simple and strong, very popular for pioneer cottages. It has undergone a few alterations over the years including having the roof raised for a loft, having a lean to built on and then having a ceiling placed under the loft. In 1864 Waimate ran alongside the vast Totara forests that remained in the area. This was referred to as Bushtown, some residents lived in the bush, some in comfortable cottages, others in temporary huts and it formed the nucleus of modern Waimate. Bremners Cottage is a survivor of the infamous bush fire that destroyed vast areas of Waimate or Bushtown in 1878. The 'big burn' began innocuously enough on 12th November 1878 with grass fires on Hunters Hills set by musterers. One was still burning three days later when a spring nor'-wester gale put in an untimely appearance. When the fires finally burned themselves out on 23rd November, after an eight-day rampage, they left part of Waimate township and much of the countryside around it a desolate, blackened ruin. The timber industry had been dealt a fatal blow and many families had to leave town because their homes and livelihoods were gone. The Bushtown website has some fascinating pages of information and is well worth a look, found it really interesting and added another local place to my list to visit when opening hours connect with a free afternoon. Every town seems to have a Scottish Hall tucked neatly away, just off the beaten track. Ours is located at 20 Barnard Street in a central area of town. This handsome solid little hall was designed by the busy local architect Walter Panton & Son and built in 1929 by Andrew Kennedy at an approx. cost of 4000 pounds. It is of red brick and concrete with white cement facings. Features include a tiled entrance vestibule, cornice, pilasters, pediments and brick gable. The flag of St Andrews is proudly inlaid above the windows. Constructed as a concert hall it had an opening stage, a couple of dressing rooms and a kitchen. Nothing to grand or fussy here but it is still aesthetically and architecturally pleasing. Over the years it has provided a venue for social and recreational purposes and still does so today. An interesting aside is that the Timaru Herald, on 15/03/1929, reported that the original roof was of British made asbestos cement, the first time this particular material has been used in Timaru! These relatively unassuming little buildings were a centre of activity in their heyday. Originally they were built by local Scottish society’s to create a cultural centre where the records and traditions of Scottish history could be preserved and where the study of Scottish music, song and literature were promoted. These Society’s aimed to foster Scottish traditions in new settlements and provide people with a chance gather together for conversation and counsel, to wear their Highland costumes and tell tales of the old country. In good condition, it is still used for Housie, music competitions and, as it is not to close to large residential areas, this makes it perfect for the Pipe Band practice venue which I understand happen here occasionally. The Hall is available to hire for events and occasions. Next time you are waiting for your turn at the intersection of King Street and Domain Avenue, glance across at the Timaru Gardens nearby. You will see a flat area of garden beds and towards the back of these are some landscaped stone steps flanked by beautifully rusticated iron urns. Sitting in front of these, amongst the beds is our Queen Victoria Jubilee Fountain. The fountain was originally located on the small reserve in King George Place, opposite the council buildings. In 1960 the monument was moved from that site and re-erected in this south west corner of the Gardens. The steps were designed and built at the same time to create a backdrop for the Victorian styled sunken garden. Although it is neat and bare in its current winter state, it is full to overflowing in the spring and summer months with seasonal plantings in the formal beds which put on a fabulous show of bright colours set off by the green landscape of the wider gardens behind. Queen Victoria ascended the throne on 20 June 1837. Her Golden Jubilee was widely celebrated by Colonies throughout the Empire on 20 June 1887, the occasion of the fiftieth anniversary of her accession. 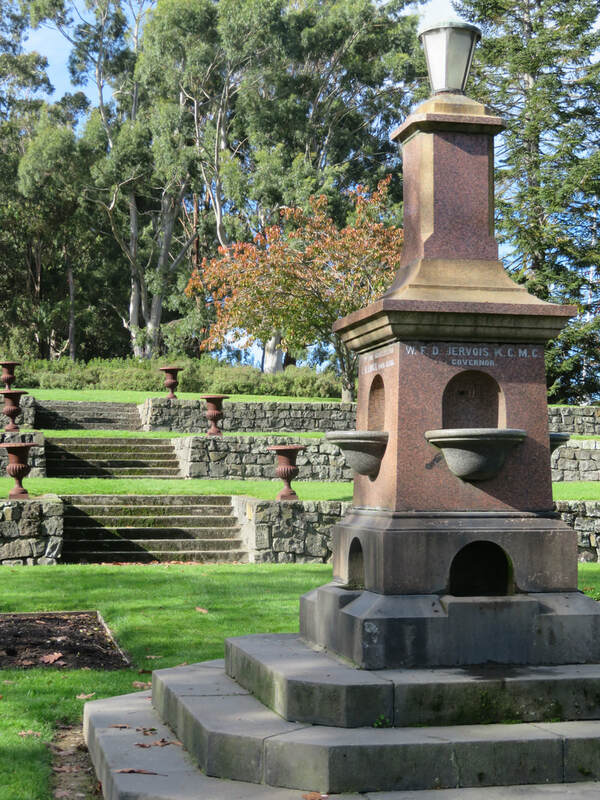 In New Zealand and in many far flung colonies memorials to Queen Victoria appeared in the form of statues and fountains to mark the event including our own Jubilee Fountain. On 26 September 1907 our then Prime Minister, Sir Joseph Ward marked an important symbolic shift in New Zealand’s perceptions of nationhood when he read the declaration of our Dominion status. The change from Colony to Dominion was one that was one that had little practical effect but Dominion status was more about perceptions – and perceptions mattered in those changing times. He hoped by doing so it would remind the world that New Zealand was an important player in its own right. It’s a subtle reminder of our colonial past, nestled quietly into a lovely corner of our town, one that also overlooks a busy intersection where our busy, modern lives are on view, hustling and bustling by. A rather nice juxtaposition. ​Innovation can come in many forms. 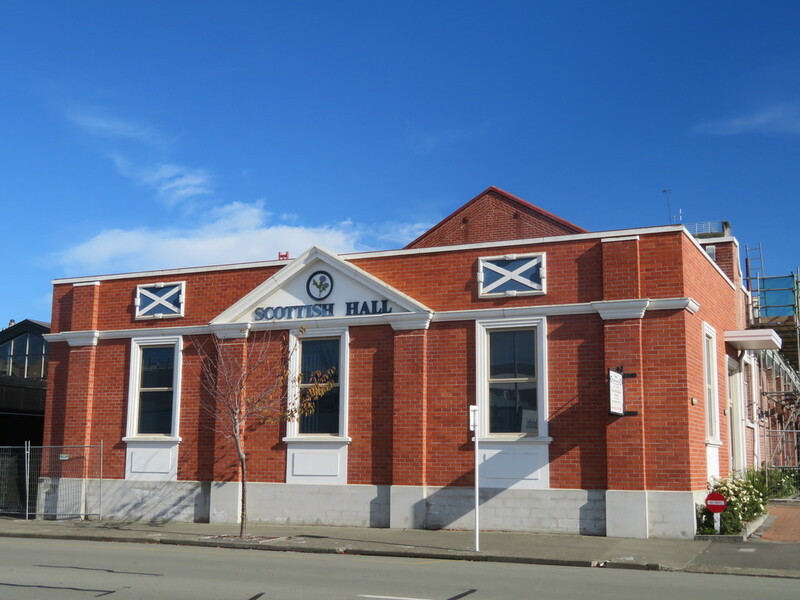 Take for example the old Timaru Garrison Hall. Designed in 1886 by the Dunedin architect R. A. Lawson (First Church Dunedin being his most famous building) it was originally designed with an elaborate facade facing High Street, but lack of Government funding meant the plan had to be simplified. The Government funding was £300, with the remaining £700 raised locally. The builder was W. Hall-Jones, (later an Member of both Houses of Parliament and briefly the 16th Prime Minister of New Zealand). The front lean-to part of the building held nine rooms, an orderly room and store room for each of the four military corps, and a general reading room. However the roof of the hall is the most innovative feature. Spanning 28 metres with a radius of 22.5 metres, it was the largest span in New Zealand at the time. Each of the main roof beams is an early example of timber lamination, twelve thicknesses of 6 x 1 inch timber laminated together with 38 kg worth of nails and bolts. Since it was calculated that the roof would expand and contract by up to 25mm across its width, one end of the beams are firmly fastened to the concrete piers, the other end resting on rollers that move with the roof. This was necessary as the weight of the original galvanised iron roof was 5 1/2 ton and that size of movement would have damaged any fastenings or the beams. The Hall was opened on the 1st September 1886 with a two day military tattoo. 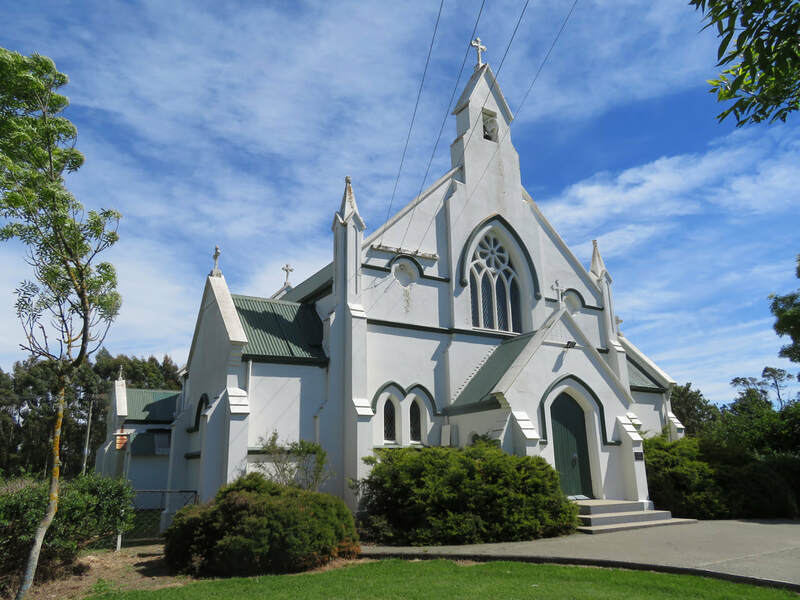 St Patrick’s Church is the oldest union church still in use in New Zealand. It stands on its original site, with Burkes Pass village to one side and the original cemetery to the other. It’s the perfect example of a local co-operating church in a small isolated community. 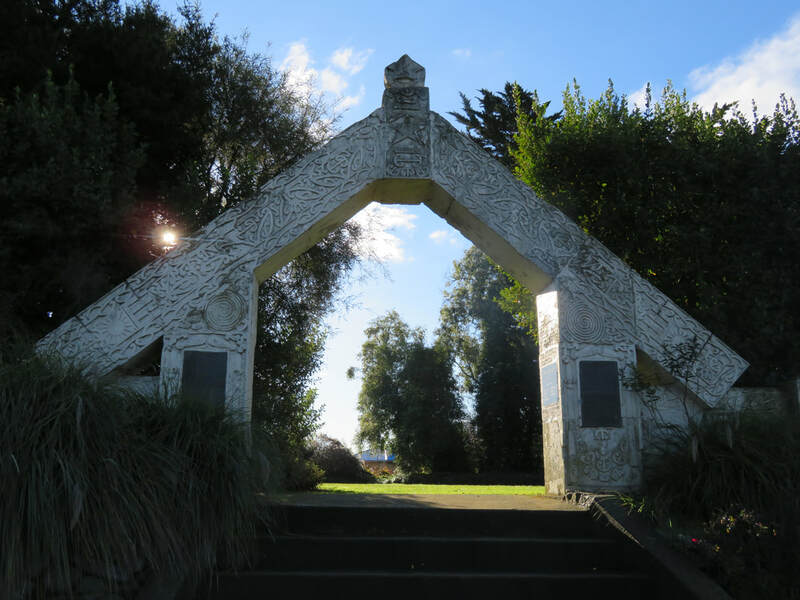 According to the information plaque provided, the early pioneers of the MacKenzie basin area met at Stansell’s Accommodation House on August 26th 1871, to plan a church which might serve the huge area from Geraldine to Mt Cook. It would be built for several denominations to use, including Anglican, Presbyterian and Roman Catholic. Burkes Pass must have been considered the last outpost of civilisation in those days. It’s hard for us to imagine the isolation of these areas in times when transport is so taken for granted but 150 years ago the churches of our high country regions played a major part in providing, not only the opportunity to congregate for religious devotion but also some much needed social contact. It was no mean feat to get to a service with attendees often travelling through snow and flooded rivers to be there. 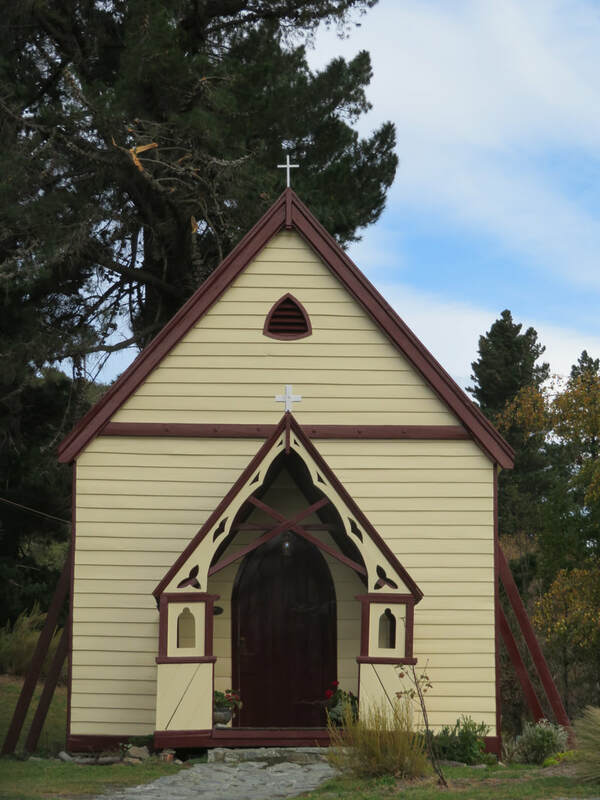 At the end of the fortnightly service the Postie, who had arrived from Timaru via horseback, would hand out the mail to the congregation as they left the church. Attending church must have been a most exciting expedition, not only fulfilling religious duties but a chance to wear your best clothes, see friends and acquaintances and quite possibly receive news and information from distant shores. It is a Heritage NZ category 1 listed building and was designed by W.Williamson. It was built in 1872 by Ogilvie and Jones of Timaru. A simple wooden construction with a Gothic style porch, lancet windows and the interior is still in original condition. It has simple buttresses and these, along with the old pines nearby, protect it from being buffeted too much by high winds and gales. What a tough, enduring little building it is. It’s withstood years of rugged alpine weather. 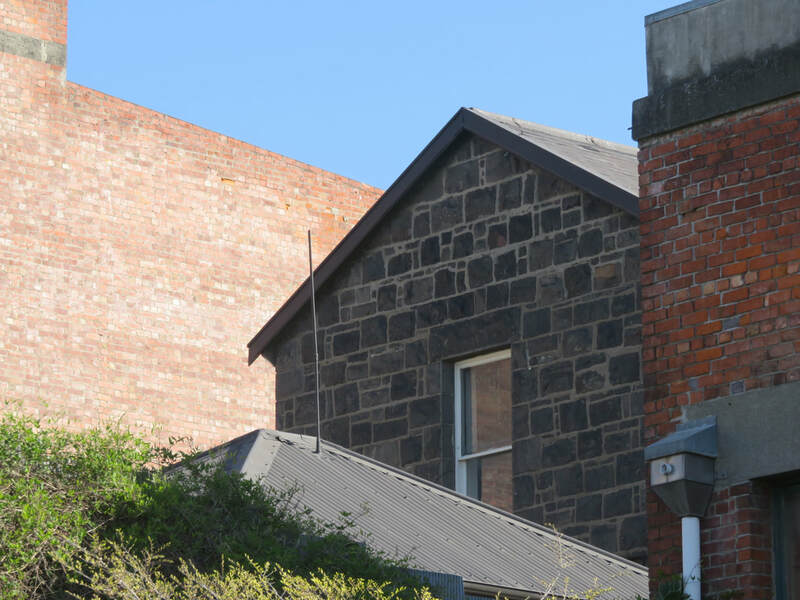 Happily, in 2000 The Burkes Pass Heritage Trust was formed to protect, retain and preserve this building for future generations. 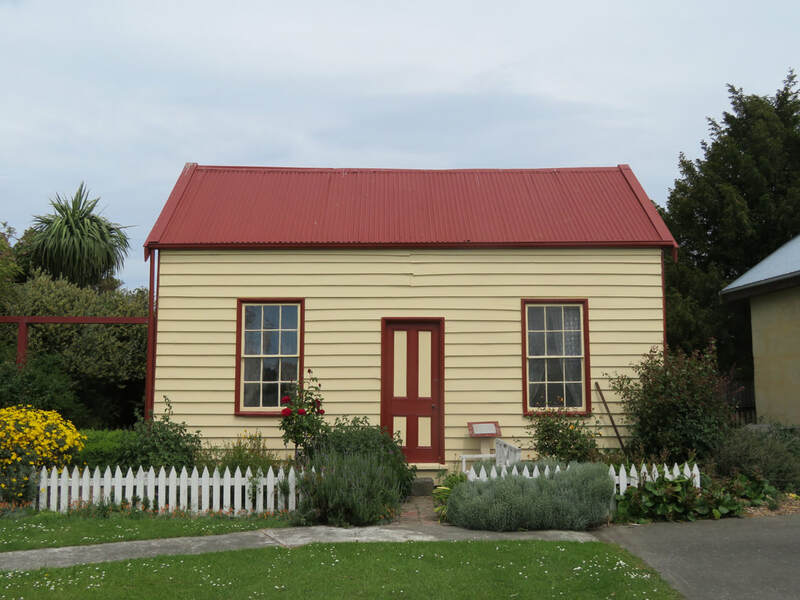 Along with the church the trust have created a Heritage walk that takes in a small Musterers hut, the Mt Cook Road Board Office which was built in 1876, the former Hotel, School and several of the sturdy cob cottages built of clay and tussock. Follow on to the cemetery for more exploring. These days it is still in use as a church, community meeting place, wedding venue and heritage centre. It is open to visitors, a delightful stop along the way and a chance to reflect on what life was like all that time ago. If you glance up Eliot St as you drive south through the township of St Andrews, you get a great view of the Eastern end of a most handsome little church. Smartly painted in white with green trim, this is St Andrews, the local Catholic church. Land for this church was originally purchased in 1895 by Father Hurlin and an enthusiastic parishioner for the princely sum of 8 pounds an acre. They purchased a total of 9 acres with the view towards future plans including perhaps a school, presbytery and convent. The need for these never arose and the unneeded land was sold off over the years. Sadly neither of these two farsighted individuals lived to see the foundation stone being laid just a few years later in December 1902. This attractive little church was completed in 1903, mainly with volunteer labour, at a cost of 1500 pounds. When the building was finished there was only 100 pounds still owing which speaks volumes about the generosity of the parishioners. This included a little building next to the church which was to provide shelter for the priest’s horse. The architect for the building was Mr J.S. Turnbull and it was built by Mr E. Hall with the timber work being done by Mr P. Foster. The church is constructed of bricks from Quinn’s brickworks at Makikihi, these sit atop concrete foundations and are stiffened by buttresses. The exterior walls were cemented and then painted white. The interior timbers are of red pine. The sanctuary is at the Western end and off this, on the north side, is a sacristy with an outer door. The window at the Eastern front which you see from the Main road is ornamented by an arched tracery window and on either side of this is a sunken circular panel to relieve the otherwise blank spaces. The turret rises above this window and houses a brass bell, this turret is topped off by a pretty decorative cross. By all accounts the opening was a festive occasion with bunting flying from the tall scaffolding, flags hung from the awnings. Speeches were held, the choir of the Church of the Sacred Heart in Timaru sang and the Battalion band played to the large crowd in attendance, there were lots of family parties and the neighbourhood was filled with vehicles and horses. The ceremony had to be delayed from 3pm to 3.30 as the Presbyterian church across the road were holding their service and did not wish to be disturbed by the band. ​The delicate lacework provided by the scaffolding around St Mary's Church feels quite appropriate in a number of ways. First, the texture relates to the refined tracery of the historic Gothic cathedrals of Europe, where stone was honed down to very fine dimensions. Such determined commitment to one building over many decades was all aimed at providing depth of detail – shadow and light – to the exterior. In turn the interior treatment was aimed at achieving a subtlety and presence seemingly beyond mere mortals. A second sense of satisfaction in seeing the scaffolding erected this week has been the evident commitment by the church authorities to restore the exterior. Climbing to the topmost platforms shown here to repair the finials on the gable ends, will surely convey a sense of pride to those special tradesmen involved. An architectural term for today: fleche – the narrow spire located on the ridge line. St Mary's stands as an important element in the CBD – since the demolition of the Hydro Grand Hotel it is now the most photographed building in town. With the renovation of the interior of Chalmers Church, and the fairly recent restoration of the Roman Catholic basilica, 3 landmark buildings have each been given a new life - to the benefit of the wider community and to visitors. ​In a television series the pop philosopher Alain de Botton commented upon the nature of holidays - or simply a change of scene. He noted that every day tens of thousands of Londoners leave that fine city for a holiday abroad. Equally tens of thousands of people arrive at Heathrow to enjoy a holiday in London. As Alain de Botton confirmed: both cohorts are entirely happy with their decisions. As time passes and the new settlements of New Zealand grow, the presence of an older town glows brightly. In an electronic age the traditional bulky buildings of a town centre are not required. One might include here the trading banks; the local offices of insurance companies; regional government agencies, etc. Newer town centres including Cromwell (on its current site), Levin and Taupo are quite lacking in buildings with weight and presence. It is the collection of well-tailored bulky buildings such as the Tekapo Buildings pictured here that provide Timaru with its unique regional flavour. Designed in 1926 by one of Timaru's most accomplished architects Herbert Hall, this imperious 3-storeyed building with its stripped classical façade provides weight and bearing to the CBD. The original drivers for this building may have passed but the contribution to the cityscape remains, not to mention the valuable space inside for medical professionals, artists and community groups. To retain the unique flavour of the Timaru town centre is to embellish its place as a unique and intriguing place to visit. Our immediate neighbour Oamaru is now bathing in the glow of its heritage buildings, all helping to entice visitors to the region. Equally colourful is the Timaru collection.